Phil Chadwick's Art: #2062 "Mulleins"
I also use art to learn about the natural world...January 20th, 2018. Mullein plants grow almost anywhere. The tall spikes of yellow flowering rosettes are a favourite landing spot for the birds of Singleton Lake. Verbascum thapsus (great mullein or common mullein and yes, I had to look it up) is a species of mullein native to Europe, northern Africa, and Asia. The plant was introduced in the Americas and Australia probably with the pioneers. Mulleins prefer well-lit and disturbed soils where it can sprout from long-lived seeds. Mulleins are intolerant of shade from other plants and unable to survive tilling. Verbascum thapsus is a biennial plant meaning that takes two years to complete its biological lifecycle. In the first year, the plant grows leaves, stems, and roots then it enters a period of dormancy over the winter. Usually the stem remains very short and the leaves are low to the ground, forming a rosette during that first year. Many biennials require a cold treatment, or vernalization, before they will flower. During the next spring or summer, the stem of the biennial plant really elongates into a two metre or taller landing post. There are far fewer biennials than either perennial plants or annual plants. Mulleins were apparently historically used as an herbal treatment for coughs, congestion, chest colds, bronchitis and inflammation. Native Americans and soldiers during the Civil War era made teas from leaves of mullein plants to treat asthma. During the 1800’s, settlers used their compounds to treat tuberculosis. Mullein produce a lot of seeds which can survive for decades before germination. 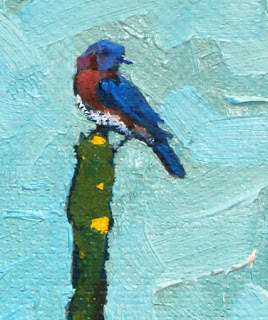 The male bluebird is painted in the characteristic hunting stance ready to dive on any unsuspecting insect. There are very few brush strokes on this bird. If I counted them there are probably 10 strokes and certainly fewer than twenty. I decided to leave those strokes alone for fear of messing them up. The background was actually looking downslope into Singleton Lake but I decided to turn it upside down and look upward. The subjects are the mulleins and the male blue bird and in this rare case the background really is just window dressing.